Hanukkah is often thought of as “Jewish Christmas“, but it’s actually far from anything resembling Christmas. Hanukkah is not a religiously significant holiday in the Jewish faith in the way Christmas (the birth of Jesus Christ) is a very religiously significant holiday for Christians. Hanukkah is a story from the book of Maccabees about the violent religious oppression of the Jewish people under the leadership of Antiochus IV in ancient times. A revolt led by two groups of Jewish nationalists and traditionalists was eventually waged winning back the Temple from the Greeks. When the Temple was rededicated there was very little oil to keep the menorah lit, only enough for one night of light. According to tradition the menorah miraculously remained lit for eight nights. An eight day festival was declared to celebrate the miracle of the oil. So for each night of Hanukkah a candle is lit on the menorah to commemorate those nights in the rededicated temple. You can read more about the lighting of the menorah and other related religious traditions here. Families typically celebrate the eight nights of Hanukkah with shared meals, often latkes are part of the meal, small gifts and dreidel games. A dreidel is a top with four sides marked with Hebrew letters which represent nit (nothing), gantz (all), halb (half) and shtell (put) in Yiddish. Each player has coins, also called Gelt (usually chocolate coins), to start playing everyone puts a coin into the ‘pot’, a player spins the dreidel and depending on which letter it lands on they get nothing, all the candy in the pot, half the pot or they have to put a coin into the pot. A great explanation of the game can be found here. 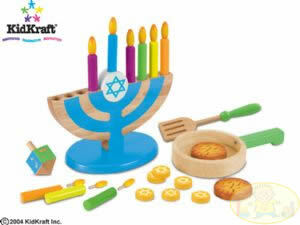 Candles and kids don’t generally mix very well, this set is great for introducing the young child to all sorts of Hanukkah traditions like the Menorah, latkes and a dreidel. These cardboard menorahs are another inexpensive and interactive way to introduce the menorah to your child. 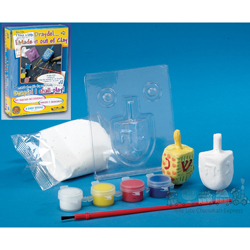 You and your child can make your own dreidel out of clay with this craft kit. Remember the song? Best of all, you can have your own private Hanukkah sing along at BeliefNet. Hanukkah begins December 4, I’d love to hear more about how your family celebrates this holiday. Did you see Martha’s Glittered Hanukkah spread this month(http://tinyurl.com/2oag5c)? Beware, my Jewish brothers and sisters: the WASP Queen is coming for your dreidels, and she’s got glitter. We have lots of latkes, that either we make at home or (sometimes) buy at Whole Foods. Top them with applesauce and/or sour cream. I usually put both, each on half a latke. Chocolate gelt (coins in gold wrap) is also key. We have some great Hanukkah CDs, too, and usually play some songs on the piano. YEAH! I’m so happy to see something in here about Hanukkah 🙂 We make latkes, light the menorah, and play dreidel. Also, we give a small gift to our son and go over the Hanukkah story with him. 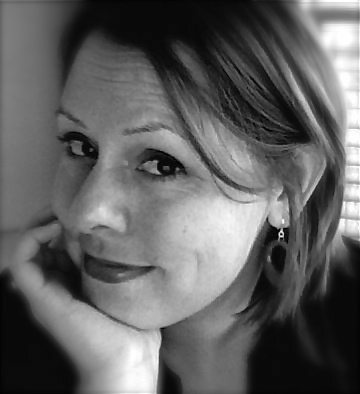 Thanks for posting about Hanukkah! And also for pointing out that it is not related to Christmas. 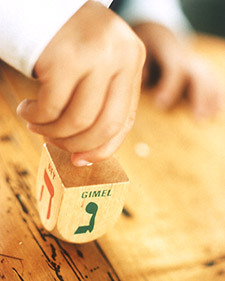 About the dreidel: Both explainations for the letters (Nun, Gimal, Heh, Shin) are correct. Those particular letters were chosen because they translate into “A great miracle happened there,” but the Yiddish translations are the origin of the game rules.